The No. 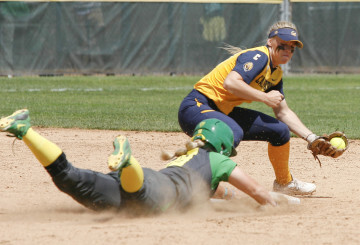 2-seeded Oregon Ducks softball team host BYU, North Dakota State and Fresno State at Howe Field for the Eugene Regionals, a four-team double elimination playoff series beginning Thursday afternoon. The Ducks (46-6, 21-3 Pac-12) make their sixth straight NCAA tournament appearance under Oregon head coach Mike White after claiming their third straight Pac-12 Championship. This Ducks roster is loaded, featuring eight All-Pacific Region selections, including Hailey Decker, Janelle Lindvall, Cheridan Hawkins, Janie Takeda, Geri Ann Glasco and Jenna Lilley earning first team honors. 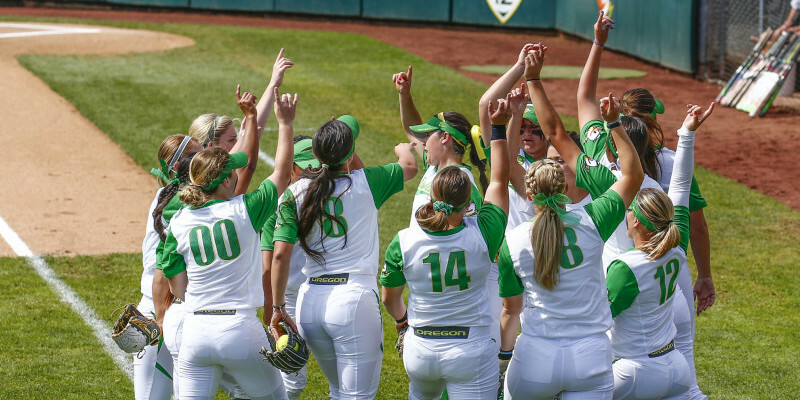 Oregon is firing on all cylinders at just the right time, providing FishDuck.com with three good reasons the Ducks have what it takes to win the Women’s College World Series. An intimidating Oregon lineup ranks third nationally in team batting average. This season, the Ducks have gone on the offensive, ranking third in the NCAA in batting average (.368), fourth in on-base percentage (.468), and sixth in slugging percentage (.616). Oregon hit 77 home runs this season, including eight grand slams, and lead the Pac-12 with 13 triples and 86 stolen bases. 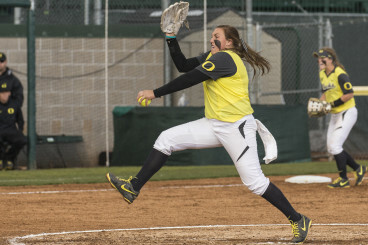 For opposing pitchers, there is no lull in the Oregon lineup. Whether it’s a stolen base or perfectly placed bunt, the Ducks are able to create scoring opportunities in myriad ways. 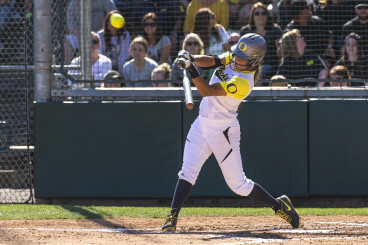 The constant home run threat, coupled with the ability to execute small ball tactics in tight situations has elevated the Ducks’ game to the highest realm of college softball’s elite. The Ducks have a roster full of playmakers capable of busting a game wide open. The depth and talent of this roster also affords coach White the advantage of tailoring his lineup to particular opponents, putting his players in comfortable matchups to maintain confidence and maximize their production. A flexible Oregon team able to produce in a variety of lineups hasn’t shied away from the competition, either. The Ducks are 19-6 in 25 games against nationally-ranked teams this season. White’s strategic adjustments, planning, and foresight has been remarkably successful, placing the Ducks in the driver’s seat for a national title. Hawkins is a finalist for the USA Softball Player of the Year award. So who is that restless figure wearing black war-paint and pacing the mound with deadly determination? That’s Oregon junior pitcher Hawkins, and one of the reasons the Ducks are playing at Howe Field for the regional playoffs. A top-10 finalist for the USA Softball Player of the Year award, Hawkins leads the Pac-12 with a 1.39 ERA. This season, the two-time Pac-12 Pitcher of the Year has amassed 224 strikeouts and pitched nine shutouts this season, icing the nation’s best hitters and keeping ranked teams off the scoreboard. And she’s not alone. Along with Hawkins, junior Glasco, senior Karissa Hovinga, junior Jasmine Smithson-Willett, and freshman Cheyenne Powell lead the Pac-12 with a 2.45 team ERA. The Ducks’ bullpen gave up the fewest hits, issued the least walks, and allowed the fewest runs in the conference. Together they have thrown for a combined 350 strikeouts. While Oregon will undoubtedly count on Hawkins to carry the load throughout the tournament, a strong supporting cast of pitchers is another reason Oregon has the right stuff to win it all. Last season, the Ducks’ historic 56-9-1 season ended with a World Series national semifinal loss to Alabama. The Ducks finished third, and were only two wins away from playing for a national title. While 2014 represented new heights for the program, the loss was a bitter pill to swallow. Oregon celebrates one of their 77 home runs this season. This year, Oregon saw the return of Takeda, Nikki Udria, Hawkins, Hovinga and Smithson-Willett from that record-breaking team. Their leadership and experience on the national stage will be imperative in getting the Ducks get to the WCWS. In particular, Hawkins and Takeda have been catalysts all season for the Ducks, helping spark Oregon’s explosive team capabilities. Takeda has led by example all season and isn’t showing any signs of slowing down. The two-time All American currently holds three career school records for most hits, stolen bases and runs scored. And with 40 career doubles, Takeda is just one double away from tying Missy Coe‘s school record. It’s clear that Takeda wants more before she leaves Oregon and will settle for nothing less than a national title banner hanging at the new Jane Sanders Stadium. The one difference from last year is that this Oregon team isn’t intimidated by the bright lights of the national stage or the powerhouse programs of the SEC. 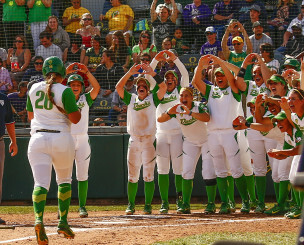 The Ducks are the best softball team in the country. But this time, they know how to prove it.